The recent posting of the Edinburgh Guy Arab re-bodied by Nudd Brothers & Lockyer reminded me of this batch of saloons delivered to Southdown in 1954. 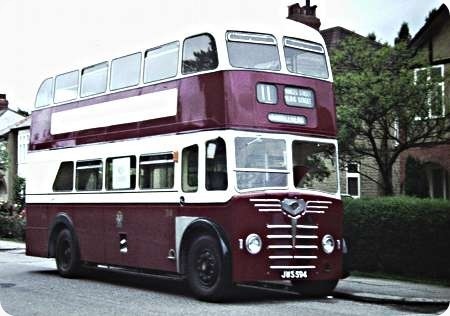 This batch of Leyland Tiger Cubs were numbered 620-639 registered MUF 620-639 with B39F seating layout which oddly had a single N/S front seat and 2 pairs at the rear with a central emergency door and a mixture of half drop and sliding ventilators as well as unusual, for Southdown, curved seat top rails. 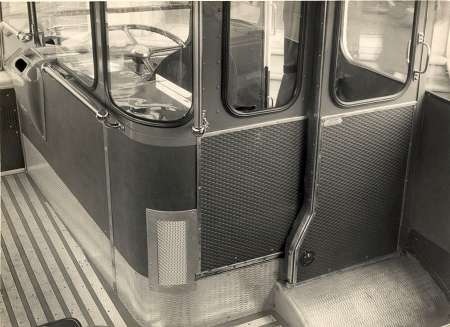 These were new at a time when large numbers of parcels were carried, so behind the cab there was a floor to ceiling compartment about the size of a wardrobe fitted with shelving for carrying the parcels at the rear of which was a sliding door into the saloon, the drivers only other entry was the sliding door to the outside. Five very similar but by no means identical Tiger Cubs were delivered in 1955 numbered 640-644 registered OUF 640-643/PUF 644. They were very light and pleasant to drive and I always thought that the Tiger Cub had the best brakes of any Leyland model of that era. Reminds me of the 1950’s Devon General Weymann Reliances. These are the only other underfloor front loaders I can remember with a separate cab door. I thought that some of the early BMMO built S types had a cab door. 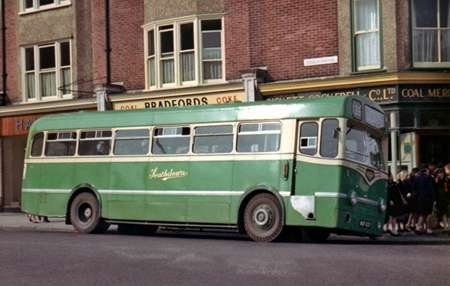 Bradford also had two AEC Reliances (501 and 502) with offside cab doors. Manchester Corporation’s Leyland Royal Tigers 20 – 23 and "Leyland" Aberdonians 40 – 45 all had the offside cab door, with a fixed partition between the cab and the platform. I think East Yorkshire also had some saloons with this feature. Your mention of parcels, D Dave, reminds me of when I lived in Southsea, 1956-76, and the GPO would hire Southdown coaches to deliver Xmas parcels around the streets. With modern traffic parking down the road I lived in, I doubt if a coach could get along it now! Maidstone & District had a batch of Harrington/Commer integral saloons with an o/s cab door. Re GPO use, can recall M&D buses and coaches hired for Xmas deliveries many many years ago. Here is a photograph of the cab of an East Yorkshire Tiger Cub which had C H Roe bodywork. Interesting that many of the early underfloor saloons had these enclosed cabs. M&D’s certainly did but they subsequently went over to the near standard practice of just using a low waist high enclosure. In today’s unpleasant society, the driver sadly needs the security of an assault proof working place but that wouldn’t have been so in the 50’s or 60’s. I assume the requirement for the cab to have an emergency exit is still in place. On half cabs the side window over the engine is usually the emergency exit. If you can’t get out if the bus goes on its offside, then there needs to be a second way out. I guess that is the reason for the sliding door at the back of the Roe bodywork in the picture. I remember the prosaic message in the cabs of the Routemasters In the event of a fire get out.!!! Frank Muir once remarked that, in all Emergency Instructions, item number two was always more important than number one. 2. Jump out of the window. From what Diesel Dave says about this beauty and the 15xx’s I get the impression our formative bus years were pretty much the same (KK 48848?). The later 640-4 were still around when I began driving but, certainly as far as the driver’s compartment went, they looked as though they’d been rescued from a chicken farm. However, for one brief interlude 638 came our way and what a dream. Somewhere along the line it had acquired one of the more modern grey enamel dashboards and could be driven with finger tip control. Is there anything on the road today that modern drivers will look back on with such fondness and respect?